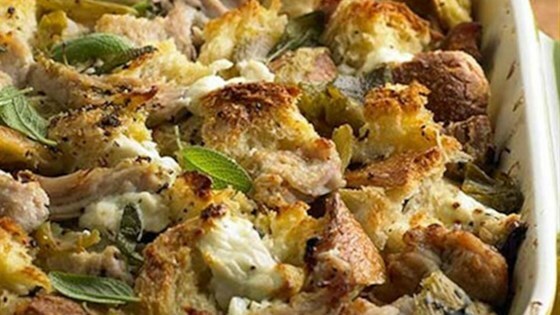 "Layers of cooked shredded pork sirloin roast, bread cubes, green chiles, goat cheese, and fresh sage are baked in an egg-milk base for this hearty brunch or main dish casserole." Coat 13x9x2-inch baking pan with nonstick cooking spray. Arrange half of the bread in bottom of pan. Top with half the meat, half the green chiles and half the sage. Crumble half the goat cheese over top. Repeat layers with remaining ingredients. Heat oven to 350 degrees F. Whisk together eggs, milk, salt and pepper in large bowl. Pour over casserole, pressing down bread to soak up liquid. Let stand 20 to 30 minutes at room temperature. Bake casserole at 350 degrees F for 1 hour until knife inserted near center comes out clean. Let stand 10 minutes before cutting to serve.